Please note you may find some of this material challenging. If you find yourself getting stuck don’t worry - help is on hand. Raise your questions in the comments area at the bottom of this Step. You can also ‘Like’ another learners questions to help us identify any particularly challenging areas. Or you may prefer to return to this advanced Step once you have completed the other material in the week. Why does the cold front catch up with the warm front, as the wave breaks and the depression starts to decay? Conceptually, it’s easiest to think of what is going on at the two fronts. At the cold front, relatively cold, dense air is pushing at warmer, less dense air – a bit like a heavier person pushing a lighter person. 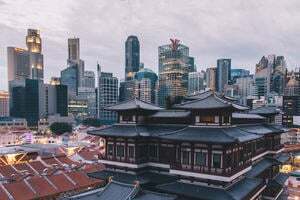 On the warm front, it’s the less dense, warmer air which is pushing at more dense, colder air – a bit like a lighter person trying to push a heavier person out of the way. If you think of it like that, it’s easy to see why the cold front could move faster. But what is actually going on? 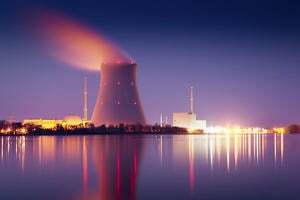 Firstly, let’s think about the rising air in the warm sector. It has to go somewhere, and so you end up with small circulations around the fronts. 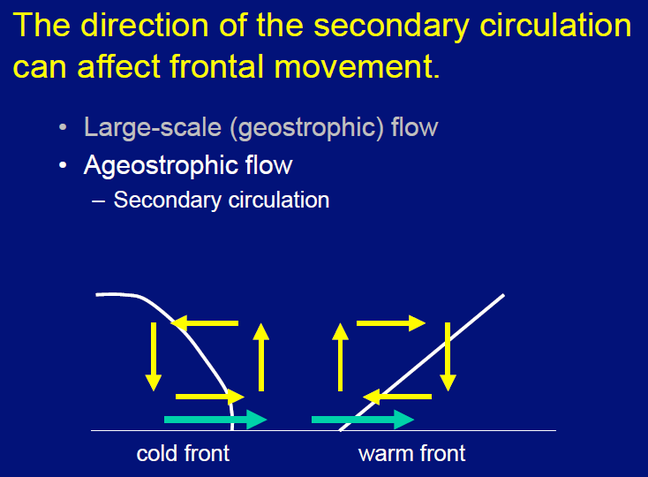 This is known as ‘ageostrophic flow’ – geostrophic flow is air flow where the pressure gradient and Coriolis forces are in balance (for example in the anticlockwise circulation of air around a depression). Ageostrophic flow is air flow where other forces are having an impact on where the air goes. The whole depression is moving from west to east – shown by the green arrows on Figure 1. With air rising in the central warm sector and circulating around the fronts (the yellow arrows), we end up with an ageostrophic flow moving in the same direction as the depression at the ground on the cold front (the yellow and green arrows are pointing the same way), speeding the front up. On the other hand, at the warm front, the arrows are in opposite directions, slowing the front down. Another thing that is going on concerns the evaporation of raindrops. Just as latent heat is released when water vapour condenses into cloud droplets, it is taken up when water evaporates. You have probably experienced this – when your skin is wet and water is evaporating, it feels cold. 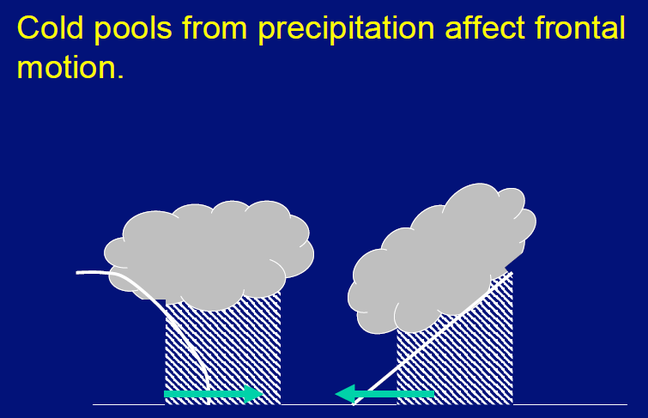 Let’s think about where the rain is falling on the two fronts (Figure 2). At the cold front, the rain is mainly falling in to the warm air ahead of the front, cooling it down and reducing the temperature gradient across the front. On the warm front, the rain is mainly falling in to the cold air ahead of the front, cooling it down even more. This also has an impact on the relative speed of the fronts.